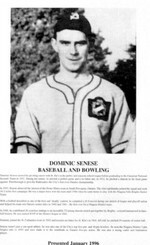 Domenic Senese started his pitching career with St. Pat's in the public and separate school league before graduating to the Canadian National Juvenile Team in 1931. During his tenure, he pitched a perfect game and a no-hitter and, in 1932, he pitched a shutout in the final game against Peterborough to give the Railroaders the City's first ever Ontario championship. In 1933, Senese attracted the interest of the Dome Mines team in South Porcupine, Ontario. The slim righthander joined the squad and went 18-2 in his first campaign. He was a major force with the team until 1940 when he came home to play with the Niagara Falls Brights Senior Team. With a fastball described as one of the best and 'deadly' control, he compiled a 26-0 record during one stretch of league and playoff action and helped his team win Ontario senior titles in 1940 and 1941 -the first ever for a Niagara District team. In 1940, he contributed 24 scoreless innings to an incredible 73-inning shutout stretch put together by Brights - a record unmatched in baseball history. He was named MVP of the District league in 1941. He joined the St. Catharines team in 1942 and tossed a no hitter for St. Kitt's in 1944. All told, he pitched 19 seasons of senior ball. Senese wasn't just a one-sport athlete, he was also one of the city's top five-pin and 10-pin bowlers. 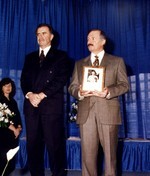 He won the Niagara District 5-pin Singles title in 1953 and once made it to the semifinals in Ontario five-pin action. He was also a strong curler and badminton player. Image may not be reproduced without the written consent of the City of Niagara Falls, Parks, Recreation and Culture Department ; induction January 1991 ; Back row, L-R:Andy Lister, Jimmy Leone (Scorer), Bobby Hardison, Phil Bova (Coach), Wilbur Whitehead, Vic Mollison (Manager), Max Kaminsky, Pete Copie, Walter Kalbfleisch. Middle Row L-R: Harry Wasser, Stan Lipka, Dominic Senese, Steve Wodynski, Tommy Wilkinson, Jack Stephenson, Garnet Morden. Front row L-R: Paul Thomas, Flae Cochrane, Leo Senese (Mascots). Missing Ralph Heximer.